Nanotechnology is no longer a merely social talking point and is beginning to affect the lives of everyone. Carbon nanotechnology as a major shaper of new nanotechnologies has evolved into a truly interdisciplinary field, which encompasses chemistry, physics, biology, medicine, materials science and engineering. This is a field in which a huge amount of literature has been generated within recent years, and the number of publications is still increasing every year. 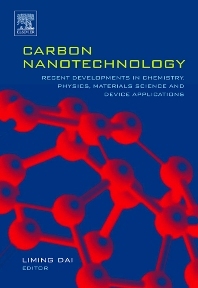 Carbon Nanotechnology aims to provide a timely coverage of the recent development in the field with updated reviews and remarks by world-renowned experts. Intended to be an exposition of cutting-edge research and development rather than a kind of conference proceeding, Carbon Nanotechnology will be very useful not only to experienced scientists and engineers, who wish to broaden their knowledge of the wide-ranging nanotechnology and/or to develop practical devices, but also to graduate and senior undergraduate students who look to make their mark in this field of the future. Scientists, Engineers, Graduate and Senior Undergraduate Students and Libraries. 2. WHY PRISTINE FULLERENE C60? 3. WHAT CAN BE INTERESTING IN PRISTINE FULLERENE FOR MEDICINAL CHEMISTRY? 5. IS PRISTINE FULLERENE C60 TOXIC? Professor Liming Dai is currently the Wright Brothers Institute Endowed Chair Professor of Nanomaterials at the University of Dayton. His expertise lies across numerous fields, including the synthesis, chemical modification and device fabrication of conjugated polymers, C60-containing polymers and carbon nanotubes. Professor Dai has published over 150 scientific papers in international journals and a research monograph on intelligent macromolecules and is inventor on several patents. He is on the editorial board of two international journals and a referee for about 30 scientific journals. Regarded by peers as an authority on functional polymers and carbon nanotechnology, he regularly lectures across the United States and abroad. Department of Chemicals and Materials Engineering, University of Dayton, U.S.A.